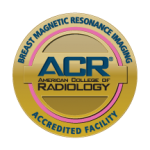 Resonance Imaging and are not present on mammography or ultrasound. In addition to being able to perform imaging on joints, head, spine, chest, abdomen and pelvis, this 1.5 Tesla high field MRI has advanced MR angiography capabilities. The MRI has a larger opening than most high field units in current use and is designed to accommodate patients weighing up to 550 lbs. Of course, for those patients who cannot tolerate even this very comfortable high field MRI, we continue to provide Magnetic Resonance Imaging services on our open Aris-II Hitachi MRI. Doctors use MRI to evaluate issues of various parts of the body, including but not limited to conditions of the bowel, spine, brain and liver, vascular abnormalities and sports injuries. MRI is painless, non-invasive and does not use ionizing radiation. 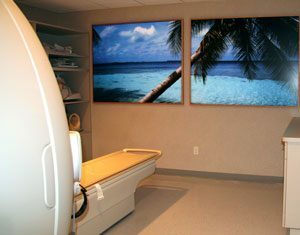 The MRI equipment uses a magnetic field rather than x-ray to produce images. The magnetic field forces hydrogen atoms in the body to line up in a certain way (similar to how the needle on a compass moves when you hold it near a magnet). When radio waves are sent toward the lined-up hydrogen atoms, they bounce back, and a computer records the signal. Different types of tissues send back different signals. The study can produce dozens to hundreds of images with no radiation. Some exams require contrast injection. The contrast allows for better visualization of some body structures. Depending on the type of exam that you are having you may be asked to change into a gown. Jewelry or any metal objects should be left at home. Please inform us if you have a heart and blood vessel device such as a coronary stent, pacemaker or ICD, any metal in your body such as clips, a medicine infusion pump, cochlear implant or cosmetic tattoos. Since the exam is performed with a very powerful magnet it is imperative that no metal objects are brought into the MRI suite. A locker will be provided for any personal items such as eyeglasses and clothing that may have to be removed for the exam.